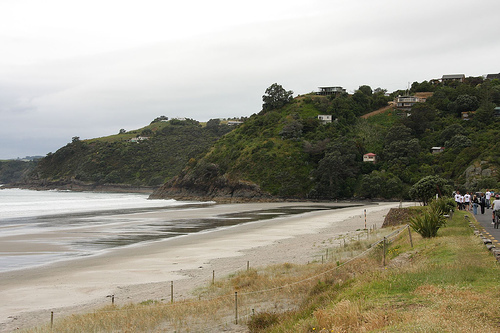 Located on the Northland, Cooper’s Beach is a little township that is situated between two Maori settlements, and has an excellent stretch of golden sand. Beach-goers can also cool off in the shade from the red-emblazoned pohutukawa trees. 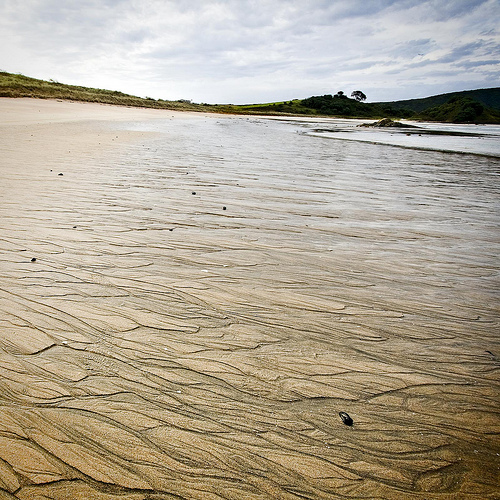 Onetangi Bay is a large bay on the northern part of Waiheke Island, which is in northern New Zealand. There is a very wide stretch of golden sand here, and people can see views for miles away on clear days. It is a great place for water sports, such as surfing, swimming and sea kayaking. The rest of the island is also very romantic, full of farmlands, olive groves, vineyards, and forests. This place is only 35 minutes away from Auckland, the major city, by ferry. The beaches on this peninsula are quite magical, with white sand and clear waters. There is a large stretch of beaches from Tokerau Beach to Rangiputa to Maitai Bay, with many opportunities for swimming. 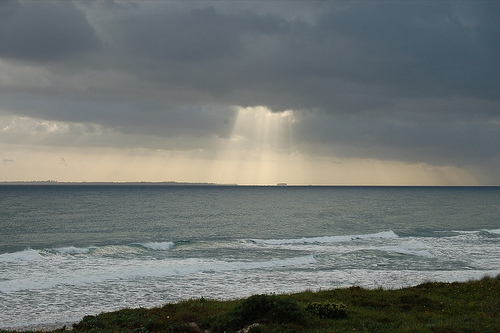 The Karikari Peninsula itself is a rocky land mass in the far north of the country, which enjoys subtropical climate. 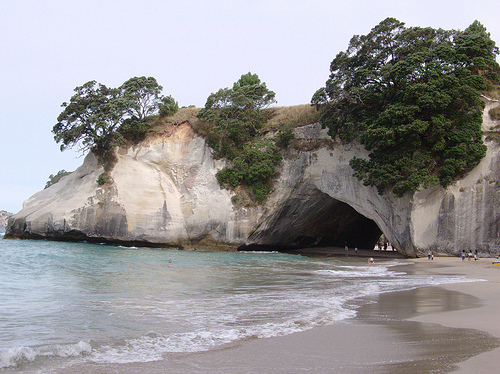 Hot Water Beach is an interesting place, which is located just south of Mercury Bay, on the Coromandel Peninsula. Further off in the water exist some underwater volcanoes with reservoirs of very hot water. This water then hits the beach surface, and cools down during this process so that humans can enjoy it. This water has high salt content, as well as calcium, magnesium, potassium and silica. This beach is also a good spot for surfing. The town of Mount Maungauni is known as a coastal resort spot, located on a peninsula in the north of the country, near the city of Tauranga. There is both a harbor beach and an ocean beach that has great surfing spots. 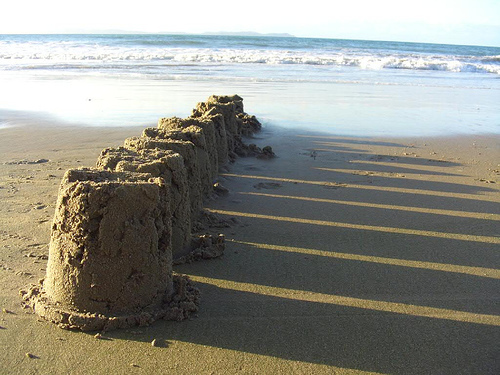 There was also an artificial reef that was established on this beach, but was somehow hampered by too many waves. Nevertheless, it is a wonderful sunbathing spot with nice scenery. 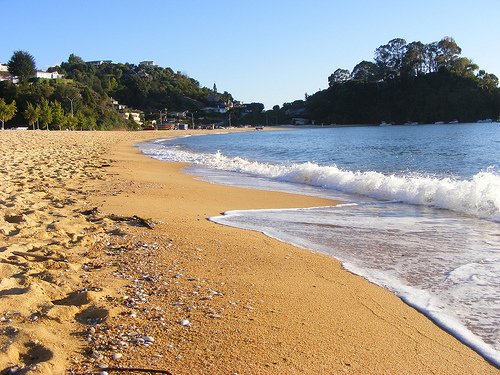 Kaiteriteri Beach is located in the Nelson region, which is the top of South Island in New Zealand. It is a smaller beach with golden sands, and is very sunny.